Shahjahan Selim was a supervisor at a garment factory in Rana Plaza in Dhaka, Bangladesh. On April 24, 2013, he remembers a huge crash when the ceiling collapsed. Dead colleagues sprawled next to him. Selim got up uninjured, then heard people calling for help. For two weeks the 37-year-old father wrested people from the mangled wreckage of concrete and steel. Selim rescued 37 people and recovered 28 bodies from the site of the world’s deadliest garment factory disaster. More than 1,100 people died when the eight-story building collapsed. The last person he saved was a man whose arm was pinned beneath concrete beams. Selim cut off the man’s arm to free him but slipped and fell four stories. Today Selim is permanently disabled. In developing countries with few resources and haphazard emergency response systems, civilians like Selim are often the first on site. Civilian first responders play an important role in disasters like the collapse of Rana Plaza or the earthquake in Nepal this April. But the work is dangerous for volunteers, especially untrained ones. In 2011, Bangladesh started an earthquake preparedness program with the government and U.N. Development Program that trains “urban volunteers” to deal with disasters. The program has worked with about 30,000 in nine cities with a target of reaching another 32,000 over the next few years. In a free, three-day course, urban volunteers learn about search and rescue techniques, earthquake response, first aid, fire safety, handling light equipment and more. Volunteers must be 18 to 40 years old with at least a high school education. Volunteers say three days is too little time to master the skills. They want more training and events to stay motivated. Retention is also a challenge because volunteers move or drop out. The program officials want to add more sessions, but funding is still up in the air. But a commitment has been made to help victims and rescuers like Selim, who went through months of hospitalization and therapy and now uses a cane to walk with difficulty. He and thousands of survivors and relatives of the dead received compensation from the Rana Plaza Donor Trust, which finally met its $30 million target last week when an anonymous donor gave $3 million. In addition, the neediest survivors like Selim got job training and funding from nonprofits such as ActionAid as well as the International Labor Organization. He opened a small grocery shop on a quiet lane not far from Rana Plaza. He makes about 15,000 taka ($194) a month versus 10,000 taka ($130) in his garment factory job. 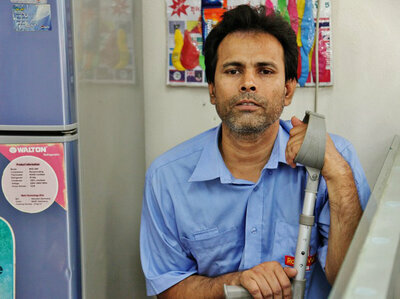 While some survivors still are unable to work, life goes on for Selim. In his tidy shop, cookies, juice, soap and other sundries fill bright blue shelves. Customers scoop rice from sacks because Selim cannot use one of his hands very well. Sometimes they make their own change from bills in a plastic box. More than 100 customers buy from Selim’s shop each day. “They know he is a kind of ‘superman,'” says Sayed Hoque of ActionAid. A young boy peers over the counter and asks for candy from plastic jars on the counter. A woman wants laundry powder. A man calls, “Selim, brother,” and requests three single cigarettes. With a trembling hand Selim gives them to his customer.